Sanicula graveolens Poepp. ex DC. 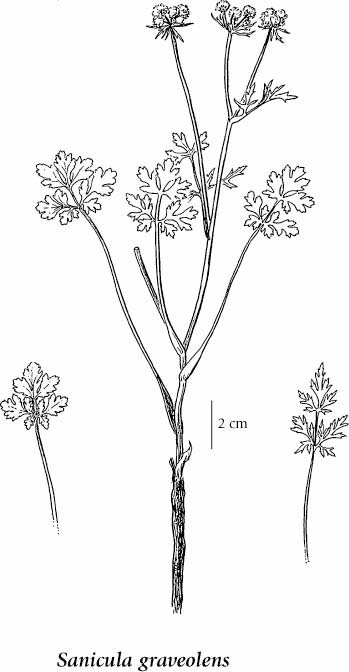 Perennial herb from a taproot; stems solitary, erect, branched near the base, irregularly branched upwards, 5-50 cm tall. Alternate; lowermost stem leaves long-stalked, often attached below ground level and seeming to arise separately from the stem, pinnately divided in 3's, the primary divisions also lobed and toothed, the blades 1.5-4 cm long, 2-3.5 cm wide, lowermost pair of primary divisions separated from the upper by a narrow, entire leaf axis; middle and upper stem leaves few, smaller, often becoming sessile. Inflorescence of terminal umbels; flowers light yellowish; involucel inconspicuous, of 6-10 bractlets. Egg-shaped to globose burrs, 3-5 mm long, covered, at least on upper portion, with stout, hooked prickles. Mesic to dry rocky slopes and open forests in the lowland to montane zones; infrequent in BC south of 53degreeN, rare northward in WC BC to 56degreeN; S to MT, WY and CA, disjunct to S. America. A shade-tolerant/intolerant to very shade-intolerant, submontane to subalpine, South American and Western North American forb distributed equally in the Pacific and Cordilleran regions. Species occurs on very dry to moderately dry, nitrogen-rich soils (Moder or Mull humus forms). Sporadic to scattered in open-canopy, young-seral forests on base-rich, water-shedding sites. A nitrophytic species characteristic of moisture-deficient sites.